Order your club clothing NOW……. We will shortly be putting in an order to Castelli for more stock of Club Clothing for 2012/13. So you need to get your orders in now. Click on the photos of kit below for more details. In addition to adding to the stock of short sleeve jerseys and bib-shorts, we are taking orders for the Winter/Spring/Autumn items, such as the bib-tights, thermal long-sleeve jersey, gilet & winter jacket. We DO NOT hold stock of these, and Castelli require us to order of at least 10 of each, so if you want them you must order now for this winter. 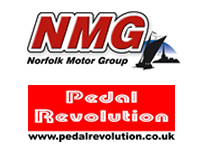 Our sponsors Norfolk Motor Group (NMG) and Pedal Revolution have kindly agreed to continue their sponsorship of the club. So the kit design will remain the same.